Some friends of mine grow these beautiful flowers. One grows white calla lilies in the garden. The other grows yellow lilies in a pot. I decided to paint white flowers this time, but perhaps will do the yellow later. These are truly elegant flowers with their simple, graceful curves and mottled leaves. 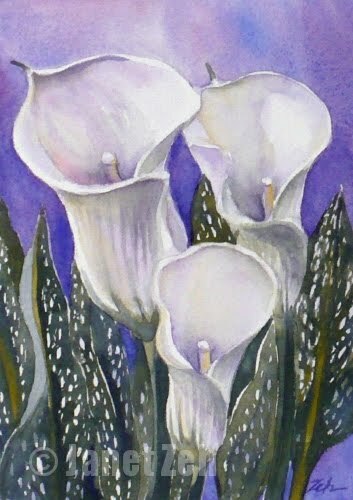 I like the way the deep blue-violet background complements the lilies, don't you?